My interest in reviewing audio products continue with the Ultimate Ears BOOM. 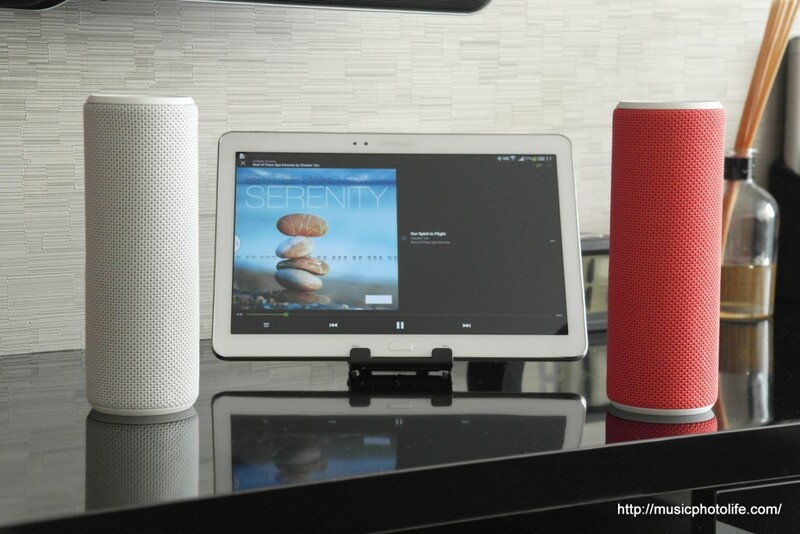 It’s the top-of-the-line speaker product from Ultimate Ears, retailing for S$299 in Singapore. That’s the same price point as the Bose SoundLink Mini. So, will the UE BOOM match the sound quality of the Bose SoundLink Mini? It is amazing what the UE BOOM is capable of. First, it is easily water resistant, stain resistant, and drop-proof. Then there is the Android and iOS app that controls the audio setup, including EQ settings, alarm, and “Double Up” mode, which essentially lets you connect up to 2 UE BOOM to play music either as identical outputs or as L-R output. It’s cool that the app actually displays the colour of the UE BOOM that is paired to the app device. There is a standard tripod screw mount at the bottom of the speaker, which is useful if you want to elevate the speakers outdoors for better sound experience. Or you could just hang it around with the ring. 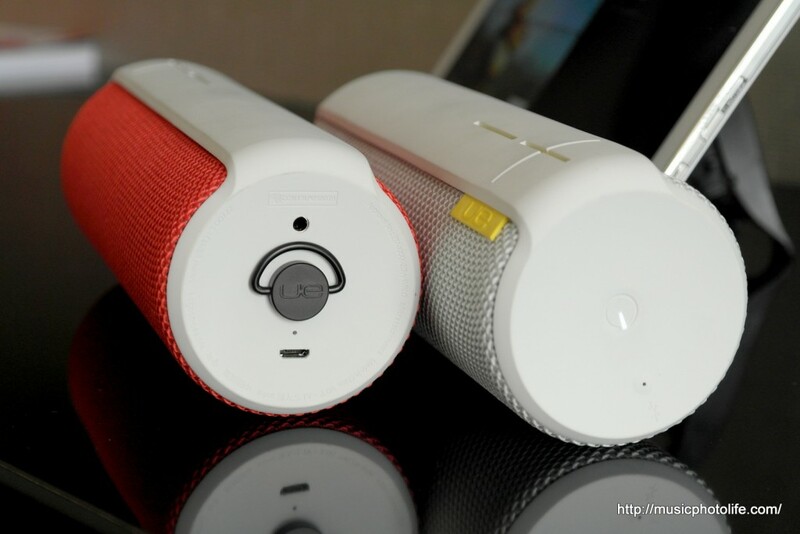 The cylindrical design of the UE BOOM is inspired by water bottle, so users can hold it comfortably and enjoy. You could even toss around without worries: the UE BOOM is “life resistant”! The UE BOOM fills the air with sparkling treble which should please people not looking for big bass sounds. 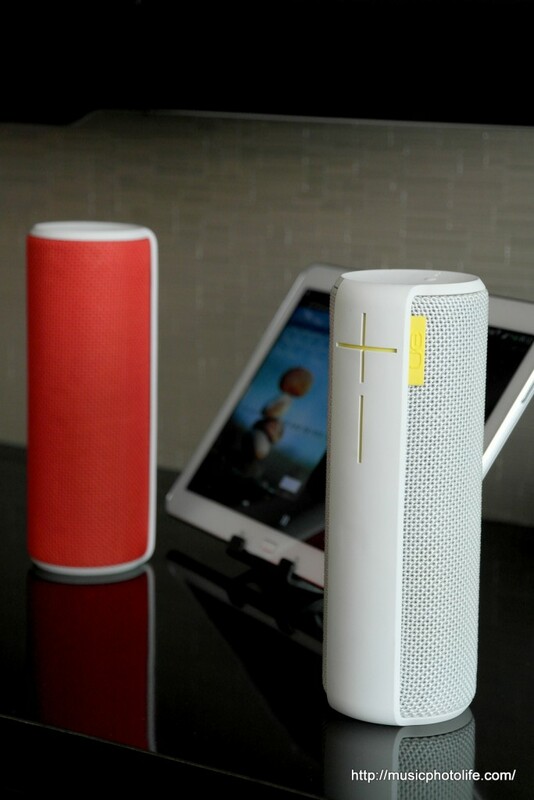 There is no subwoofer feel from the output, so the UE BOOM will not replace your home stereo. There is no distinct stereo sound imaging coming out from the UE BOOM, which aims to deliver 360-degree immersive sounds. Not even the “Double Up” can churn out any spectacular sound staging. I do like the “double” mode so that I can place speakers in different rooms for simultaneous audio playback. 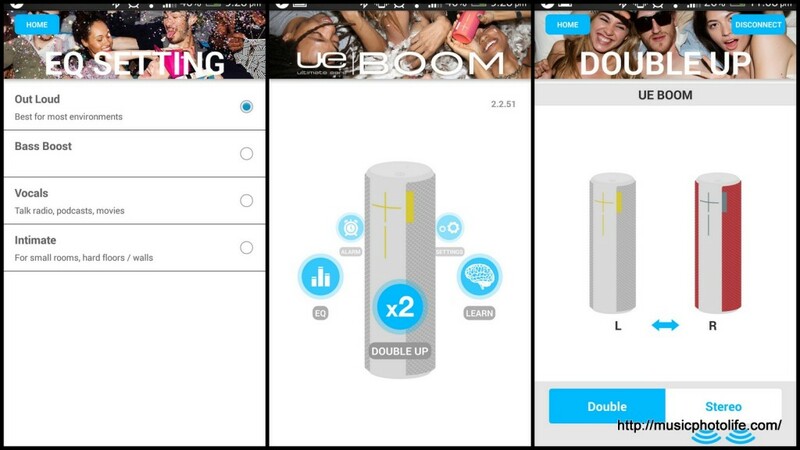 The constraint of allowing up to 2 units further limits the usefulness of this “Double Up” mode, so it is a great feature for multiple UE BOOM owners to double up the sound when they get together. – Out Loud: delivers loud and more dynamic sounds. – Bass Boost: suppressed treble and improved low-mid, but still not much bass feel. – Intimate: boost on treble, making the sound thinner than “Out Loud”. Comparatively, the Bose SoundLink Mini sounds warmer, and delivers a lot more deliberate subwoofer feel that can seriously match home speakers. In fact, both products should not be compared at all. The features and the sound quality are so different that the only similar thing between the 2 products is the price. The UE BOOM speaker produces clear and brilliant undistorted sound for fun casual listening, and the key selling factors would have to be its “life resistant” properties of being water resistant, drop proof, as well as the app features. But if you desire a professional-sounding portable wireless speaker to give you heavy kicks in the bass frequency, I would again recommend the Bose SoundLink Mini. Pingback: Music.Photo.Tech.Digest: 18 Jan 2015 – Music.Photo.Life. Pingback: UE MEGABOOM Waterproof Wireless Speaker Review - Music.Photo.Life.